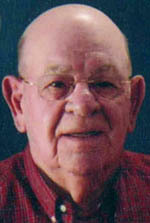 Robert “Bob” L. Brehm, 77, of Berthoud passed away peacefully on January 3, 2012 at his home. He was born December 10, 1934 in Johnstown, Colorado to Adam and Mary (Schafer) Brehm. He graduated from Berthoud High School in 1953, lettering in football and basketball. Bob married Charlene Johnson of Berthoud on February 26, 1956. He was drafted into the U.S. Army in 1958 and received an honorable discharge. In May of 1959 he retired from Hewlett Packard after 32 years of services. Bob was well known as an avid outdoors man and farmer, he loved farming his 35 acres of land just south of Berthoud. Bob enjoyed his retirement and winters in Arizona, motorcycle riding, boating, small game hunting , and fishing. Funeral services will be held Saturday, January 7, 2012, 10:00 A.M. at LifeBridge Christian Church, 10345 Ute Highway, Longmont. Viewing will held Friday from 5 p.m. – 7 p.m. at Viegut Funeral Home and one hour prior to services at the church. Interment at Greenlawn Cemetery in Berthoud. Memorials may be made to LifeBridge Christian Church in care of Viegut Funeral Home.